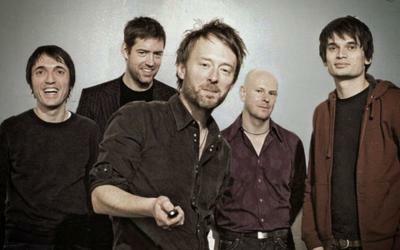 The seminal rock band drops a few surprises, much to the joy of Radiohead fans. You never really know what to expect from Radiohead until the band lets you know what to expect, and even then, there are still likely to be surprises. In the past week alone, member's of the extremely influential English quintet have dropped a couple of news releases, with drummer Philip Selway announcing tour dates for his new solo album Weatherhouse and guitarist Jonny Greenwood, who has penned some excellent original scores for some memorable movies, showing off his classical chops with the Australian Chamber Orchestra. While those announcements were nice, it's nearly as exciting as, you know, Thom Yorke confirming that Radiohead is currently in the recording studio working on a new album. Wait, what was that? You're saying that Yorke did confirm such a thing? Well, that's awful swell. Both Greenwood and Selway had suggested in interviews earlier this year that the band would potentially head to the studio this September, so perhaps the most surprising part of this whole exchange is that Radiohead didn't actually pull any surprises. Of course, there's no hint of any future release date for the band's ninth full-length studio album, so Radiohead fans out there will have to wait for the follow-up to 2011's King of Limbs, but it's okay to start getting excited. While there aren't actually any new Radiohead songs to report, that doesn't mean that there are no alarms and no surprises here. Yorke managed to drop a new solo album, an eight-track collection entitled Tomorrow's Modern Boxes that is available for download on BitTorrent Bundle. That doesn't mean that you can get the album for free, mind you, as Bundle has a paygate, asking that you kindly provide $6 for the latest set of songs from the lazy-eyed king of alternative muisc (and twitchy dancers). It's been a good week for Radiohead fans and no matter what your feelings were on the band's last album, I'll go out on a limb and say that new Radiohead is better than no Radiohead. What's more, this means that the band should be back out on the touring circuit in the next year or so, which is an excellent thing to think about while you listen to Tomorrow's Modern Boxes and wait.